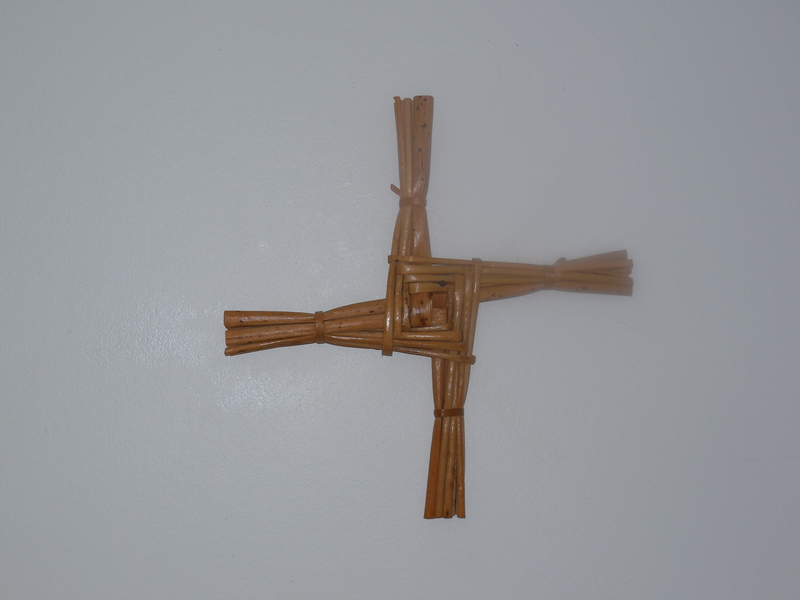 On February 1, new St. Brigid’s Crosses will be placed in many traditional homes throughout Ireland. They honor St. Brigid, the “Mary of the Gaels,” who lived during the 5th and 6th century and is considered the patroness of Ireland. The legend associated with St. Brigid’s Cross tells how a pagan Irish chieftain was near death, and Christians in his household asked Brigid of Kildare to attempt converting him to their religion. Brigid arrived but the chieftain was raving mad and not coherent. The dirt floor of the room was covered with rushes and Brigid took some of the rushes to form a cross. The chieftain saw the cross, calmed himself, and asked Brigid what it meant. She explained the story of Christ was able to convince him to be baptized. This is the Christian version of the St. Brigid‘s cross story. Most believe the cross made of rushes (or straw) was pre-Christian and used for the festival of Imbolc that honoured the Goddess Brigid of the Tuath de Danann. Imbolc was the Celtic feast midway between the winter solstice and spring equinox. It was usually celebrated on February 1st or 2nd. Imbolc means “in the belly”, and it signified the birthing of lambs that occurred around that time. It anticipated spring and prepared the early Celtic people for early planting. Some believe that Imbolc was celebrated in Neolithic times as well. The rising sun at Imbolc illuminates the inner chamber of the Mound of the Hostages (a passage tomb) on the Hill of Tara in County Meath. After Ireland became Christianized, the date of the pagan feast of Imbolc became the feast-day to honor St. Brigid. Some still believe that St. Brigid is merely the Christianization of the pagan goddess by medieval monks. However, the life of St. Brigid is well documented by writers starting in the 7th century. St. Brigid was born into slavery around 450 AD. Her father was a Leinster chieftain and her mother was one of his slaves who had been baptised by St. Patrick. As she grew older, Brigid performed many miracles such as healing the sick. Her charity became well known. She took food and goods from her father to feed the poor. On one occasion, she gave the sword of a Christian king, who was visiting her father, to a beggar. This king recognized her saintliness and convinced her father to give her freedom. In 480 AD, St. Brigid founded a monastery in Kildare on the site of an older pagan shrine to the Celtic goddess Brigid. St. Brigid was the first to organize a consecrated religious life for women. She founded two monastic institutions, one for men, and the other for women. She founded other religious institutions elsewhere in Ireland as well. Brigid died in 521AD at Kildare, supposedly on February 1st. She was buried in a bejewelled tomb at her monastery, but her remains were moved to Downpatrick after her tomb was threatened by Viking raids. 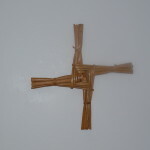 St. Brigid’s Cross is made fresh with rushes (or straw) and hung in homes on her feast day to protect against fire and evil. It remains in the home until the next St. Brigid’s Day when another cross is hung. Crosses may be placed in out-buildings for their protection as well. 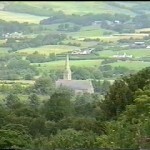 Crossroads and Finn Valley from Gleneely. 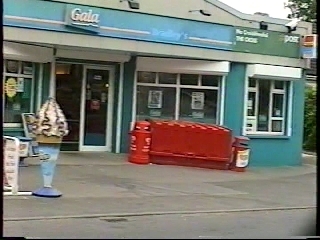 Henry Bradley was proprietor of Bradley’s Gala Store at “The Cross”, a village in County Donegal near Killygordon. He was postmaster of the post office located at the store as well. Through the years, Mr. Bradley composed several excellent poems, some of which were brought to my attention recently. One poem, “Going Back to Ireland”, caught my eye because the settings in his poem are the same locations I used in my novel in “Donegal Generations” about life in 18th and 19th century Ireland. Mr. Bradley tells me “Going Back to Ireland” is about an emigrant who often thought about returning to Ireland but for some reason never did. Old age and hard times caught up with him and there is little chance of him ever going back. His consolation is that he still has his memory, and while he has his memory, he can go back there in his dreams. 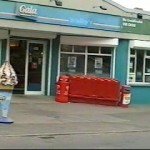 Mr Bradley is now retired and lives in north-western County Donegal. and to see a sunset at the end of day. to a home I left too many years ago. but next year came and went and I didn’t go. I can go back there in my dreams. I’ll know my journey home is near an end. and view familiar sights once again. of friends; when they and I were running free. when I stroll beyond “Bonners” big oak tree. are sights I’ll see if for moment I would stall. to nights I danced in the old tin hall. where many years ago I learned to swim. with many tears shed upon the floor. before the evening light fades away. tucked away behind the bushes and the trees. lie sheltered and snug from the winter breeze. a place from where the angelus bell doth chime. would resurrect memories of a joyful time. forever engraved upon my mind. as did “Ballyarl” and “Drumfergus” too. I was thankful for the work I had to do. and left my footprints around “Mounthall”. When I was small and everything looked tall. of the valley and sights below. where the waters clear and crystal flow. But precious sights will forever be with me stay. remind me that it’s too long I’ve been away. THE SHIMERING BROOK WENT TUMBLING BY. FOR THINGS THAT WENT ON AROUND. AND THE KINGFISHER PEEPING IN. THE DISTANT PAST, THE HERO’S OF LONG AGO. AND FAR OFF PLACES I WISHED TO GO. THE MOON AND THE STARS ON HIGH. AND CHILDISH DREAMS HAD YET TO DIE. ON DOWN THE GRAVEL BRAY. WHEN THEIR SURPLUS WATERS GREW. AND OUT PAST MEADOWS SOFT AND LOW. WHEN THE SUMMER SUN; BURNED HIGH? AS DID BRIER’S, FERN’S AND WOODLAND TREE’S. AND BEE’S WOULD HUM ACROSS THE BREEZE. WHEN THE RAIN FELL HEAVY FROM THE SKY. WHEN ICY WINTER WINDS BLEW BY. TO JOIN WITH OTHERS ON THE WAY. BECOMING RIVERS AS THEY GREW. THE “FLEDGELING” STREAM’S WERE SUCKED FROM VIEW. AND THERE AMIDST THE RAPID THRUST THE “FLEDGELING” STREAM’S WERE SUCKED FROM VIEW.